Edward Stanley "Eddie" Prokop (February 11, 1922 – May 30, 1955) was an American football player. 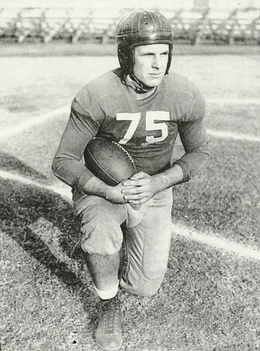 He played college football at the Georgia Institute of Technology and in the National Football League in the 1940s. He was the first pick (4th overall) in the 1945 NFL Draft for the Boston Yanks. Prokop played college football at Georgia Tech under coach William Alexander and was a 1969 Hall of Fame inductee there. In the 1944 Sugar Bowl Prokop led his #13 Yellow Jackets to 20–18 victory over #15 ranked Tulsa. In that game he rushed for 199 yards, threw a touchdown and kicked two extra points. The Sugar Bowl did not award a game MVP until 1948. Prokop was the second of five first overall picks by the now defunct Boston Yanks. He played for the Yanks in the 1946 and 1947 seasons. Prokop played the 1948 season as a member of the Chicago Rockets only to return to Boston in 149 for his final season as a professional. Prokop's brother Joe also played in the AAFC. ↑ "Eddie Prokop NFL Football Statistics". Pro-Football-Reference.com. Retrieved 2012-05-07. ↑ "Georgia Tech Official Athletic Site". Ramblinwreck.cstv.com. Retrieved 2012-05-07. ↑ Casey Bienvenu. "1944 Game Recap / Allstate Sugar Bowl". Allstatesugarbowl.org. Retrieved 2012-05-07. ↑ "Eddie Prokop Past Stats, Statistics, History, and Awards". databaseFootball.com. Retrieved 2012-05-07. ↑ "Joe Prokop". pro-football-reference.com. Sports Reference LLC. Retrieved October 24, 2015.